Our partnership was initiated with a launch in three different cities in Finland in March 2017. Now, we have organised events together in several countries, spread across Europe, Australia, the US, Africa and Asia and are planning to continue our collaboration. The overall goal of this partnership is to increase the amount of female leaders, by inspiring more girls to choose a career in Science, Engineer, Technology and Mathematics. Nokia shows it's innovations and technology in some extraordinary workshops, including one about Virtual Reality. Participants coming from local schools as well as schools connected to Nokia employees get to experience a unique experience with amazing volunteers and rolemodels. Take a look at the cities we already brought our events in with Nokia! Our last event in 2018 was in Madrid, with the terrific team of Nokia! Fom drawing into VR to learning the chemistry behind bath bombs, 100 girls could experience all the fun in science! Just a day after our event in Shanghai, we were thrilled to launch our g4g Day in Hanghzhou, where 60 excited girls discovered all the fun in science! What a pleasure to be back in Shanghai for our second g4g Day! Together, with an amazing local team, we organized an event for 120 girls, ready to take up the world! In November, we were thrilled to be back for a 2nd g4g Day in New Jersey, to inspire 100 girls for a day of STEM fun at the groundbreaking HQ of Nokia Bell Labs! 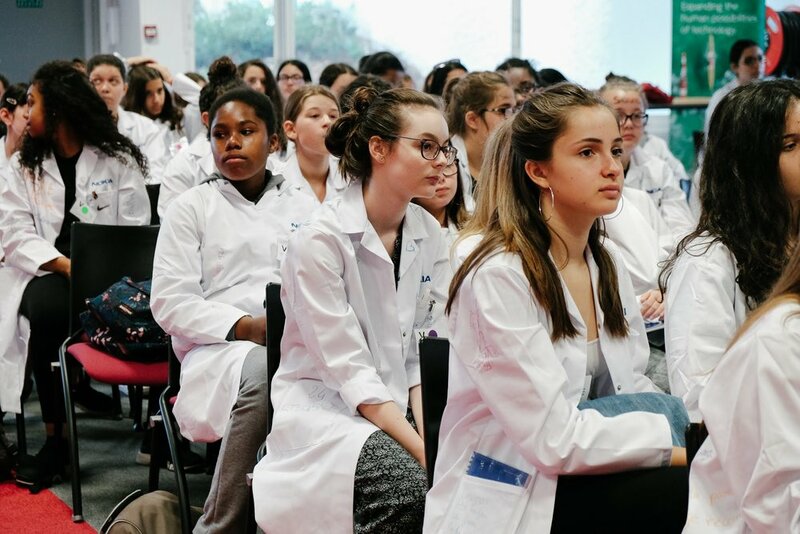 Nokia in Paris-Saclay and g4g hosted 200 girls for this 2nd g4g Day. Yes, the caisses à savon, the drones and the 5G technology were all back this year again for a wonderful day! Once again, Nokia and g4g partnered up in Finland for three fabulous events in Espoo, Oulu and Tampere. We inspired over 400 girls ... and can't wait for 2019! In December Nokia & g4g had a successful launch in Shangai, giving a 120 girls the opportunity to discover Nokias technology and innovation. In November, we took our g4g Day to the Nokia premise in Bangalore, India. 100 girls spend their day participating in fun, interactive, hands-on workshops related to STEM. In October, Nokia & g4g, with support from the Women's Right to Education Programme (WREP) , organised a very first g4g Day in Abuja, Nigeria. 80 girls experienced an amazing day revolving around STEM. We went to Paris in June, where 200 girls had a day filled with STEM workshops and activities. Not only did they learn tons of fun new things, in addition, these exciting things were taught by inspiring role models! In March, Nokia and g4g started off their partnership by bringing the science fun to Espoo, Oulu and Tampere. We inspired over 400 girls and all 3 cities are preparing for their 2nd annual g4g Day in 2018. ... And so much more! Want to see where we're going next together? It's all on our event calendar ! !